I don't get people. I'm sure she's a lovely woman and fabulous blogger. But something about the name The Not So Desperate Chef Wife seems insulting. Or is it? I mean, I'm not desperate. It was originally a play on words for a show I never watched. Would The Desperate Housewives be insulted that I changed their name? Hmm... I guess I'm not insulted after all. According to some illogical adage, I should feel flattered. In a way, I do. But if you get inspiration from someone, giving credit where credit is due is always courteous. A link would due. I'll give her a link. It's what I do. it does sound a bit insulting but yet again some ppl like that tend to glamorize their lives when they really arent glamorous at all. i feel like her attempts at being glamorous simply because she married a chef fall flat. her blog is nowhere near as well-written, interesting, or helpful as yours- i read one post, and had to stop with no desire to go further. insulting or not, don't let it phaze you. what's in a name?... and you get the points for orginality on your reality show "spinoff". 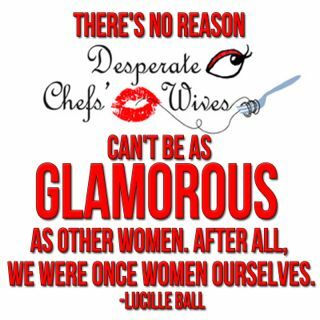 "Desperate Chefs' Wives" is interesting because you share with us and vice-versa your personal experience since you are married not only with a chef, but with his work, his kitchen, his knife, his recipes, his dreams,his passion and his crazy talk during sleep. And all of us (the wives) are experimenting the same things with our own husband. Not all the chef's wife are in the same line with her chef husband career, but we support them because we love them. Sometimes I don't care about recipes or flavors or sauces, because I have other interest, I'm good in the kitchen, but I hate the kitchen (when I cook nobody else is in there, that's my rule).But this is the reason we are together because we are different! The other blog that she's not so desperates, maybe she like to cook a lot and they share recipes and do brainstorming about new things to do with the food) BUT, we all have those thing with our personal chefs! 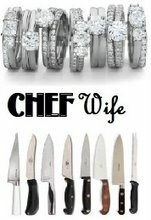 Maybe she's married to a chef who dosen't work real chef hours. Plus she's only pregnant just now. She will get a taste of what it's really like soon. Just came across this article and thought I had to straighten a few things out. 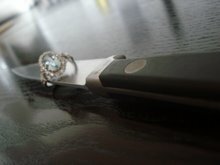 First off, I love your site and what it means to so many chef wives out there. We are all different in how we deal with our situations and husbands careers. Secondly, I had been playing around with several blog titles and I was actually watching The Desperate Housewives when the name of my blog dawned on me. I can see where you may think I got inspiration from your blog title, but I truly didn’t. The last thing I would ever want to do is insult someone else, so I felt the need to respond to this. Anyway, I hope to keep in touch with you and hope you have a fabulous weekend! Glad to have you with us, KristaM. It's a nice site but "chef" is a delicate title to throw around and it's really an honor that is given by their chefs -- it's a personal pet peeve of mine. ARE YOU A SINGLE CHEF LOOKING FOR LOVE?